Since its birth, the cinema has enjoyed a special relationship with a fellow product and emblem of the modern age, the steam engine. The locomotive is not only the subject of the first ever projected film - the Lumière Brothers ' L'Arrivée d'un train à la Ciotat , (Arrival of a Train, 1895) - but can take credit for what many consider cinema's first modern storyline in Edwin S. Porter 's The Great Train Robbery (US, 1903). Today we might label the former a 'documentary treatment' and the latter 'genre escapism': realism vs. romance. But it was the steam engine's ability to unite these tendencies, to be at once reassuringly familiar while suggesting the unknown, that made it a vehicle for cinema's special destiny, and gave it the enduring pull on the British cultural imagination. With the Bamforth Company 's A Kiss in the Tunnel (1899) the formula was already in place. The film featured a stolen kiss aboard a carriage car, with the realistic sets and footage of a speeding train heightening the effects of a middle-class couple's moment of abandon. David Lean would later weave 86 spellbinding minutes around this moment, imbuing his Brief Encounter (1945) between 'ordinary people' with the atmospheric potential of a railway station and expressing the promise of forbidden romance in swaths of steam and dark subway passages. Powell and Pressburger 's 'I Know Where I'm Going!' , made the same year, focuses less on the love story than the emotional journey of its protagonist. It begins for Wendy Hiller 's Joan Webster on a gloriously idyllic journey by train to Scotland, and through Michael Powell 's alchemy the carriage becomes a canvas for her dreams, hopes and fears. The original virtue of steam, however, was high speed. One of the first British sound films used the London-Edinburgh Flying Scotsman locomotive for this reason. A noir-ish tale of jealousy and revenge in which the actors (including a young Ray Milland ) did their own stunt work, The Flying Scotsman (1929) evoked both the glamour and menace associated with the steam locomotive, so much so that the train's eminent designer Sir Nigel Gresley demanded an opening disclaimer stating that such practices did not and could not occur on the London North Eastern Railways (LNER). Half a decade later, in The 39 Steps (1935), Alfred Hitchcock shot footage of the same King's Cross-Edinburgh train, memorably barrelling across the magnificent Forth Bridge in Scotland. Following Hitchcock 's lead (his own love-affair with trains began with the delirious Number Seventeen , 1932), British cinema of the 1930s used steam engines as much for their ability to confound appearance and reality as for kinetic thrills. The locomotive generated a façade - be it lovely or terrible - which masked a more disturbing reality in popular comedy-thrillers of the day. In Walter Forde 's The Ghost Train (1931), a supernatural legend runs interference for a group of murderous international smugglers. At the climax, summary justice is enacted by the locomotive itself. More intriguing is Hitchcock 's classic The Lady Vanishes (1938), which uses a sleepy Central European resort as the jumping off point for an espionage drama aboard a steam train. The title character is a kindly old lady who turns out to be a British spy, and the continental doctor with the admirable bedside manner connives to secure secrets for an enemy government. Embedded within the film is a pointed critique of appeasement, as the British passengers turn a deaf ear to the heroine, who is preyed on by increasingly aggressive German villains. Writers Launder and Gilliat had developed these themes earlier in Seven Sinners (d. Albert de Courville, 1936), a film notable not just for its overt political edge but for the unusually spectacular footage of a real train crash at its conclusion. Hitchcock 's passengers also provide evidence of the way the environment aboard a train was thought to destabilise British class borders and restraints. Different types of 'Englishness' are represented in what might be called a 'flies-in-a-jar' narrative. Their foreign counterparts - though sometimes jingoistic caricatures - then act as foils, through which various, often class-based problems are worked through. This motif is extended in a more cosmopolitan direction in Rome Express (1932), also from the pen of Sidney Gilliat . Its master-slave relationship between a shady businessman and his beleaguered butler is echoed by that between a street urchin-turned-Hollywood star and her hands-on manager. British filmmakers made free symbolic use of trains, from the wildly inventive dream sequence of 'I Know Where I'm Going!' (1945), in which human forms morph into engine into components, to Hitchcock 's dark free associations of churning train wheels and train whistle howls with women's screams. With his 'railroad trilogy' ( Snow , 1963; Rail , 1967; Locomotion , 1975), documentarist Geoffrey Jones went one better, choreographing the rhythms of these components into breathtaking short films, which grant the properties of rail a life and poetry of their own. Jones 's trilogy was begun after the announcement of the so-called Beeching Plan of 1962, which closed one-third of all British railways on economic grounds. Yet, being made for British Transport Films (BTF), they allow no defeatism. As the autonomous industrial film unit of a newly nationalised transport industry, BTF sought interesting ways to introduce new technologies to Rail employees and the British public at large. Not all BTF works were as dazzlingly original as Jones 's, but they were consistently engaging and rewarding, and their craftsmanship - guided by head of production Edgar Anstey , a disciple of John Grierson - was impeccable. Even as the egalitarian promise of Labour wilted under the economic realities of the postwar 'austerity' years (and the Conservatives' ideological Transport Act of 1953), BTF continued to trumpet the progressive aspects of technology, imbuing their odes to modernity with a subtle respect for the past in films such as Elizabethan Express (1954), Train Time (1952) and A Future on Rail (1957). The torch was slowly passed from steam-powered trains to electric and diesel. BTF's forward-looking attitude stood in stark contrast to the diminishing returns of Ealing Studios or to mainstream culture in general, which as the 1950s wore on began to show signs of hand-wringing at the closing of railway stations and the disappearance of steam. Steam engines increasingly became a symbol for all that was small, leisurely and community-based. An early example is the late Ealing comedy The Titfield Thunderbolt (1953), which pits the steam engine not against new rail technology, but against dastardly privatised buses. Threatened with the closure of their branch line, the villagers win the day thanks not to the speed of their engine, but its slowness. A decade later this trend was in full-force, with villainous stand-ins for the hated Dr Beeching himself, as in Runaway Railway (1965). The trend perhaps culminated in the ultimate steam-age nostalgia-trip, The Railway Children (1970). When in the 1970s, nostalgia became a true industry, steam found its way to the age of the Hollywood blockbuster in Agatha Christie 's Murder on the Orient Express (1974). 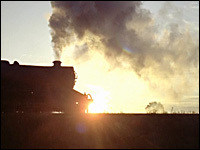 Sidney Lumet 's admirable film shows an absorption of steam's cinematic past, with an international cast of characters to rival Rome Express and a mastery of Hitchcock's bag of tricks, most memorably in the opening when the steam engine roars to life, lights ablaze like a film projector in the dark. One can almost hear Wendy Hiller 's voice ring out, 'I know where I'm going!' and smile at the thought that it's not necessarily so.